"The Banjo-ologist" A dedicated program of his career and vision. Broadcast nationaly in 133 markets to high Nielsens. 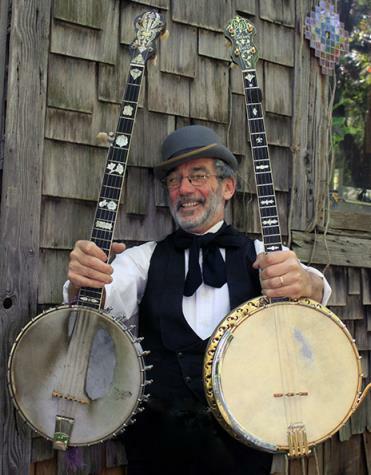 "Americas Banjo; A Musical History" Writer and performer. Aired repeatedly. "Education Through Music" Principal performer illustrating the concepts outlined. "Writing for an Audience" Principal interviewee on-air and the McGraw-Hill book. Featured news segments on NBC and ABC. "The staff were all talking about your show... and they've seen everything!" "The Audience were glowing when they came out!" comedy, kept the whole show upbeat and fun. You made us look good." I consider this a true sign of a master artisan and educator." "You are amazing!...everyone relaxed & smiling, just as you promised." "People were fighting to get into your show. That's what I call a festival event!" and promote a spirit of family unity, peace & joy." and we never get all three of them to comment on anything!" if such a thing is possible." California Arts Council to select the highest quality performers in the state. highest possible rating of excellence. City of London Festival, England Chichester Festivities, England. Special Guest Star at Sacramento Jazz Jubilee and the California Banjo Gathering. Art Councils too numerous to list, as well as scores of city and county series. J. Paul Getty Museum (2) UCLA Hammer Museum CA.State Historic Society Official State celebrations at the Governor's mansion, capitol, and Sutter's Mill. California Educational System consulting and soundtrack work. Nevada Day Celebration California State Parks Assoc. Custom show for "Treasures of the Smithsonian" Tour, Crocker Art Museum. State Fairs of California, W. Washington, Utah, Illinois, Ohio, PNE Canada Numerous festivals, colleges and special events throughout the continent. ...and many more events like yours!
" I laughed alot...a high energy show! You sure fit alot into the time you had!" "I heard you were a great banjo player, but you're funny too!" "That was brilliant! How you described the era, to set up the context of each song. You obviously did a lot of research...that was amazing and enjoyable." "I appreciate your enthusiasm, and the contrasting styles. "Each year we know we will find one show that is the gem of them all. And you sir; you are the gem of this year." "It was awesome. My mom was there and she even laughed." "That's tight man! You got the house! You rocked!" "My face hurts from smiling so much!" that thing with people...like him n' Pete had."